If you're spending Thanksgiving in the D.C. area, there's no shortage of fun outdoor events for the whole family. Here are some popular races in the D.C. area that are still accepting registration. 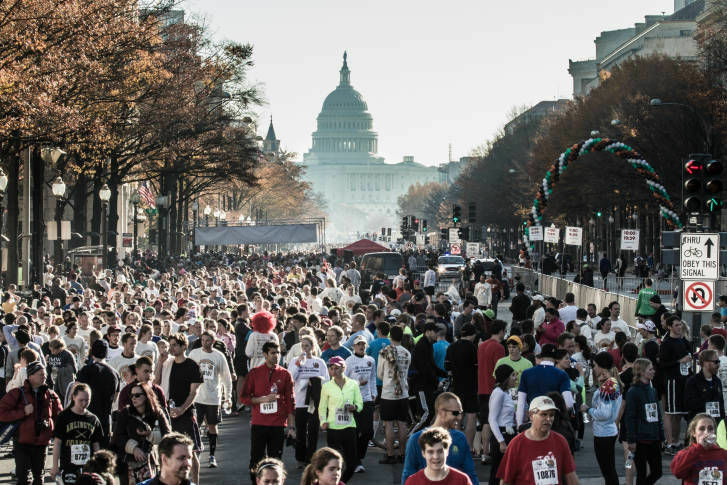 WASHINGTON — Turkey trots are a great way to get out and about before settling down for a royal feast on Thanksgiving. If you’re spending Thanksgiving in the D.C. area, there’s no shortage of fun outdoor events for the whole family. Give to a good cause and get some exercise while stuffing your morning full of fun with a turkey trot near you. What: Join interfaith, community-based charity So Others Might Eat (SOME) in lending a hand to D.C.’s hungry or homeless. Run the whole length of Pennsylvania Avenue on Thanksgiving morning in D.C.’s premiere turkey trot. Or, for the kids, head down to the 1-mile Little Turkey fun run where young winners will get a medal at the finish line. When and where: Runs start between 8:30 a.m. and 9:15 a.m. from Freedom Plaza in downtown D.C. on Nov. 22. See exact times on the event’s website. Tickets: Register in advance for a discount: $40 untimed, $45 timed, and $15 for the children’s 1-mile “Little Turkey” event. Otherwise, all prices are $50 day-of. What: If you’re spending the holidays in the Alexandria area, this no-pressure, scenic Turkey trot through the heart of Del-Ray is a great prelude to your Thanksgiving dinner. Billed as a straightforward and flat course, the yearly Alexandria turkey trot offers easy going for runners and walkers alike. Dogs and strollers are also welcome, and the event even offers special prizes for the first duos of either to cross the finish line. For standard runners, the trot offers up to $500 in cash prizes. Head to the event’s FAQ for more details. When and where: 9 a.m. sharp Nov. 22, near the intersection of East Spring Street and Mount Vernon Avenue in Alexandria. The trot both starts and ends near George Washington Middle School. Tickets: Register online until 8:30 a.m. on race day. Early fees are $20 for age 22 and over, $15 down to age 13, and $5 for kids under 12. Same-day registrations cost $5 extra. What: Organized by the Christ Church of Arlington in 2006, this trot was founded in the spirit of bringing Arlington together for a good cause. Registration fees go to a number of local charities who work to provide homes and food to Arlington’s less fortunate. The original run attracted 300 participants, and the event has steadily grown through the years — this year’s run promises to bring thousands to the streets on Thanksgiving Day. When and where: The event starts at 8 a.m. Nov. 22 from the Christ Church of Arlington at 3020 North Pershing Dr. in Arlington. Tickets: Adults can run for $45 each and children between ages 6 and 17 can run for $25. Children under 6 can participate free of charge. What: This trot benefits those who have been touched by cancer, including patients, survivors, friends and loved ones. Participants can chose a 5k or 2k run that raises to support the Inove Life with Cancer organization. When and where: 8 a.m. Thansgiving Day. The race will be held rain or shine at the Virginia Run Community Center on 15355 Wetherburn Court in Centerville, Va.
Tickets: The 5k race costs $35 per registrant and the 2k walk is $20 per person. What: Kick off turkey day with a smorgasbord of races in Bethesda to benefit the Bethesda-Chevy Chase Rotary Club Foundation and the YMCA Bethesda-Chevy Chase. One of the region’s oldest continuing turkey trots, the 36-year-old event often sees thousands of runners of all ages embark on a 10K, 1K, 2-mile fun run or 50-meter youth ‘tot trot’ starting down Old Georgetown Road. “You can make it possible for youth and families in our community to participate in Y programs, receive free teen and family counseling and other needed services from local nonprofits that keep them safe, engaged and valued,” the event’s website said. When and where: The 10K kicks off at 8:30 a.m. Nov. 22 from 9401 Old Georgetown Road in Bethesda. Tickets: $46 per ticket for the full 10K, and between $10 and $20 for the shorter 1K and 50 meter challenges. Register here as either an individual or a team.